According to the NFPA 70E, Arc Flash is a “dangerous condition associated with the release of energy caused by an electric arc.” It is measured in terms of arc flash incident energy E (AFIE), which is used to determine the level of Personal Protective Equipment (PPE). An arc flash is the light and heat produced from an electric arc supplied with sufficient electrical energy to cause substantial damage, harm, fire, or injury. This can occur near high power electrical equipment such as transformers, service entrance switch gear or generators. The first step to protection conduct an Arc Flash Hazard Analysis which defines the procedures and limits the damage of electrical arcs on personnel and, by measuring the released energy, defines the risk and determines the relevant level of the PPE required. Is the garment compliant with SANS 724:2010, NFPA 70E:2009 and SANS 984/IEEE Std 1584? Can they send you the relevant certifications? Does the garment meet your required HRC level? If so, can they send you the test reports that include photos? It’s important to note that where more than 40cal/cm2 APE is required it is not recommended unless all other means of reducing the risk of exposure has been investigated. 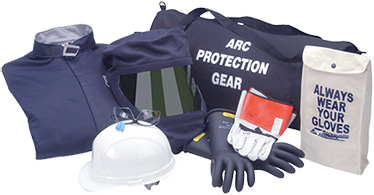 The Arc PPE you use really is your last line of defence, and following the above steps ensures that you are doing the best you possibly can to minimise injuries as a result of an arc flash incident. Information supplied by: Dromex Personal Protective Equipment. ‹ Tip of the Month- Saving water!